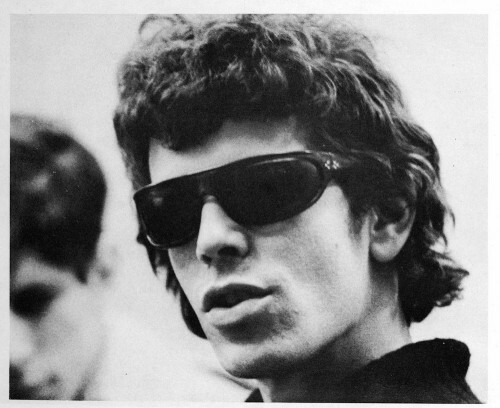 Ultra-Cool Lou, with the Velvet Undergound,1966-67. Lou Reed Transformed, circa 1974. 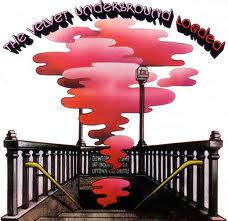 The LP cover of the Velvets’ fourth album, “Loaded,” Lou’s final with the band (which, sans Lou, would actually release one more, ill-advised post-Reed LP). 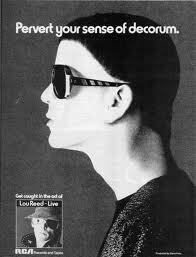 1970s advertisement for Lou Reed solo album. 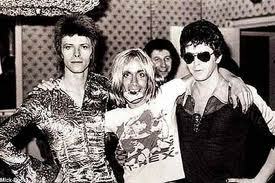 Four glammy, glittery icons party down in the early ’70s (from left): David Bowie, Iggy Pop, and Lou Reed. The fourth? Why, Marc Bolan of course, as seen on Iggy’s T. Rex T-shirt! Amazing photo by the great Mick Rock, whose work I’ve always loved. The news that Lou Reed, singer-songwriter and architect of the iconic ’60s band The Velvet Underground, died at the age of 71 today — on a Sunday Morning hopefully as gentle, beautiful, and tender as his song of the same name — strikes me both as sobering and strangely surreal as Reed’s best music. We don’t know all of the details yet beyond the fact that liver disease had reportedly claimed him despite a life-saving liver transplant last May. But there’s certainly no confusion about where Reed and the Velvets stand as artists and influences along the vast landscape of rock & roll: near the very top of a towering, jagged peak. With a deadpan monotone barbed with a thorny edge of sarcasm that gave way to an air of hollowed-out self-loathing and jaded disaffection, Reed’s voice was ideally suited to chronicle his drug-and-drag noir tales (both lived and imagined), of shadowy protagonists slinking down shadowed hallways, darkened alleys, or penthouse crash pads, in search of sin, salvation, or both at the end of a needle. Meanwhile, the Velvets — which included guitarist Sterling Morrison; avant-garde viola master John Cale; drummer Maureen “Mo” Tucker; and, initially, on its 1967 debut, the femme fatale chanteuse and German model Nico — held in their hands the perfect sound and sensibility to articulate Reed’s unsparing vision. The Velvets were at once tough and disturbing; brazenly unfettered and unbound by the pop pigeonholing confines of genre: A palette-cleansing antidote to the paisley flower power psychedelia swirling around them, yet in their own way every bit as “psychedelic” as the Beatles, Grateful Dead, Jefferson Airplane, or Jimi Hendrix. Their drug visions were cold hallucinations cut with a brutal clarity and a chilling sense of dread. They were also obsessively primitive and insular, and at times martially, monochromatically insistent ; as dolefully repetitive as the artistic works of their early benefactor, Andy Warhol. I would argue — hell, I have argued — that their 1967 debut, “The Velvet Underground & Nico” is every bit the landmark work as the Beatles’ “Sgt. Pepper’s Lonely Hearts Club Band,” released that same year. It is nearly impossible to imagine a significant segment of what would come to (lamely) be called “college” or “alternative” rock during the 1980s and ’90s, had Lou Reed and the Velvet Underground not existed. Just off the top of my head, for instance, would the Jesus & Mary Chain, My Bloody Valentine, Dream Syndicate, Yo La Tengo, Spacemen 3, Galaxie 500, Mazzy Star, or scores of other bands have even been a glimmer in their creators’ imaginations without VU? I don’t think so. My sentimental favorite of the Velvets’ brief but brilliant canon has always been their 1970 swan song album, “Loaded,” which to me was softer, prettier, more melancholic and wistful than their earlier efforts. Plus it had “Sweet Jane” and “Rock and Roll,” two of my favorite (and in the case of the latter, most personally meaningful) rock songs of all-time. The album had been intended to be the band’s commercial breakthrough, a polished and more “pop” record than anything the Velvets had attempted. But troubled circumstances undercut those intentions, and the LP was ultimately instead relegated to the what-might-have-been file. By this time, Cale was out of the band and Tucker, pregnant at the time, was mostly absent from recording. Bass guitarist/multi-instrumentalist Doug Yule and his drummer brother Billy had been brought aboard (Doug’s contributions, including lead vocals on several tracks, would prove substantial), and Reed had turned his gaze from “Loaded” to what would be a solo career that would carry with it some magnificent highs (“Transformer”), contrarian challenges (“Metal Machine Music”), and barely listenable lows (“Ecstasy”). (As an aside, for a good chunk of his first decade as a solo artist, Reed served as both muse and adversary for the legendary rock critic Lester Bangs, who sparred with Lou frequently in print and interviews. In fact, with the exception of hearing “Walk On The Wild Side” on the radio, I first became acquainted with much of Reed’s early solo output by devouring old back issues of “Creem” magazine, whose pages Bangs graced prolifically). In tribute to Lou Reed’s extraordinary work and singular place in rock ‘n’ roll history, here’s an arts cover profile I wrote on the band back in 1997 for The State, a Knight-Ridder daily newspaper, around the time of a long overdue deluxe reissue of “Loaded.” Much like the band itself, the album had since been reappraised and widely regarded as a lost and essential classic. My piece was also timed to local concert appearances by Cale and Mo Tucker, the latter of whom I met after her show. 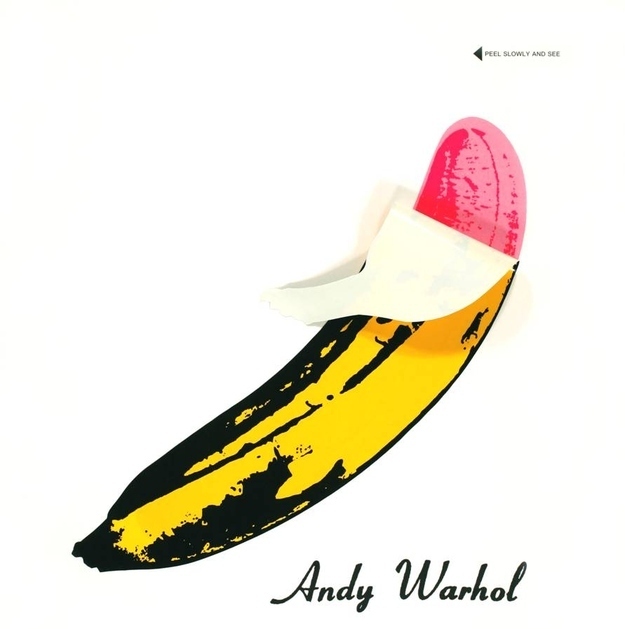 I introduced myself as the reporter who had interviewed her in advance of her show, and she was kind enough to sign my original gatefold pressing of “The Velvet Underground & Nico.” When I handed her the album, she looked at the peeled banana on the cover and exclaimed, with what seemed genuine surprise, “Wow, you’ve got an original here!” As she signed my record, I beamed back at her. Yes, I remember thinking, I do. addiction, “Heroin,” when the club owner angrily approached Reed and the rest of the band. imposing shadow cast by the band looms nearly as large as it did 30 years ago. commercial failure during its four-year run between 1966 and 1970. “No, of course not,” said Tucker in a telephone interview from her south Georgia home. more introspective and subdued mood during Yule’s tenure. band’s forays into feedback-drenched avant-garde expression. according to Yule. It’s a decision that Tucker hasn’t found easy to live with, either. time.” Which begs the question, why didn’t the band wait for Tucker to record “Loaded”? Like Lou Reed and Jenny who put on that New York station and couldn’t believe what she heard, some of us had our life saved (or at least liberated) by rock ‘n’ roll too. Reed left this mortal coil three years ago today on a Sunday Morning that, I hope, was as lovely, peaceful, and beatific as the Velvet Underground song of the same name that graced their debut LP. In tribute to the man who, solo and with his band(s), shaped the sound of so much that came after (indie-rock, lo-fi, and so-called ‘slowcore’ owes a huge debt), here’s the remembrance piece I wrote the day Lou died, followed by an older feature originally published in The State, “South Carolina’s Largest Daily Newspaper,” when my favorite Velvets’ album, “Loaded,” was given a deluxe reissue. Hear from Velvets’ drummer Maureen Tucker and guitarist/bassist Doug Yule about what it was like playing in the band, working with Lou, and making the band’s final album — to me, as great a swan song masterpiece as any artist has put to wax. Oh, and make sure to dance to some of that fine, fine music today.